Palais de Tokyo - Paris’ seat of contemporary art - often divides opinion. From stark minimalism to outlandish "what is it?" creations, exhibitions often conjure a love-it or hate-it reaction. Would Les Grands Verres, the institution's latest foray into cuisine, have the same result? 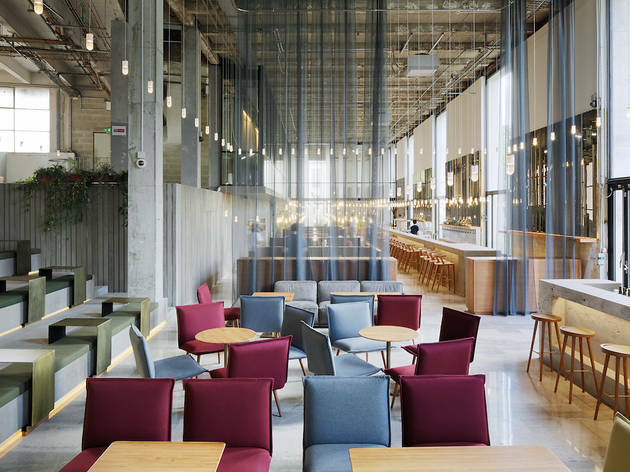 On paper, it seems to be a winner in teaming up with Quixotic Projects (the innovative group behind bars and restaurants Candelaria, Glass, Mary Celeste and Hero) and Lina Ghotmeh for the design. With 170 covers, the space already has one thing in common with the exhibitions - it’s giant. A sea of hanging lightbulbs, light wooden tables, artisanal crockery - Les Grands Verres is divided into two. Intimate box-style seating fills the first section, with the bar to the right and kitchen to the left. Beyond, there are larger, open plan tables with a more convivial spirit. The crowd is chic but diverse; couples, big groups of friends, and families. 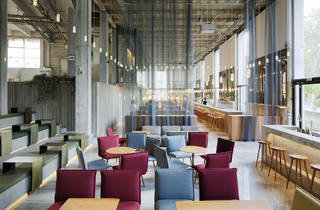 Given the location near big attractions and arty types that Palais de Tokyo brings in, you can envisage all sorts here. Right, onto the serious stuff. It's classed as Neo-Mediterranean, although the menu seems open to artistic interpretation. Mussels with Indian spices, celery and parsley butter; fattoush salad; a whole baked artichoke. We plumped for the fresh sounding melons and tomatoes - a colour pop of watermelon, yellow, black and red tomatoes, and honeydew melon. Pollock-flicked with bright green olive oil, it’s a masterpiece on the plate and in the mouth. Not quite as attractive but just as delicious, were the chicken croquettes which open with a stunning of vision pulled meat, topped with a lick of moss green spring onion mustard. The main dishes go bold. Grilled cuttlefish (rarely seen on menus these days) with abricot purée, grilled cucumber, almonds, chilli, and yoghurt was beautiful and moreish. The shoulder of Berkshire pork (sublimely tender) with smoked aubergine and new potatoes was great but the plate was overwhelmed with meat. The fish of the day (on this occasion a shark that was caught in error) was paired with garlic purée, smoked courgettes and pickled prunes. A palette-beating of flavours. While it was a great experimentation, the on-plate balance was out of whack. A big focus on smoking and pickling intensified flavours and there wasn’t enough to even it out. Your best bet is to order a few plates in a group and try a bit of each - more satisfying than a single plate to yourself. The wine list is strictly bio and the sommelier does a good job in guiding you to a new favourite. A cocktail menu tailormade for the restaurant will go down nicely with fans of Candelaria et al. Like the Palais de Tokyo’s art, our best advise is to go with an open mind - you might find you love it. *Insider’s tip: there’s one table in the back with a perfect full view of the Eiffel Tower - the best seat in the house to see the twinkles come nightfall.